More price drop news from Marc Haendle at Ocean Independence as he sends word of a €260,000 cut the 26m motor yacht Cento by Excalibur. This superyacht was built by FIPA as part of the Maiora range in 2001 to a design by Roberto del Re. RINA classed and MCA compliant, she sleeps six guests in a master, VIP and double cabin and has a range of 500 nautical miles at 18 knots. 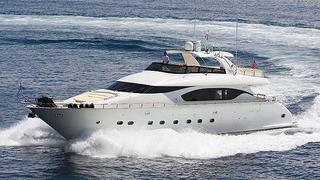 With a successful charter record behind her, she has the all-important Spanish charter licence. On display at the Pama Superyacht Show, Cento by Excalibur is down from €1.45 million to €1.19 million, VAT paid.